Huge motoring organisations do not choose their breakdown agents by chance. 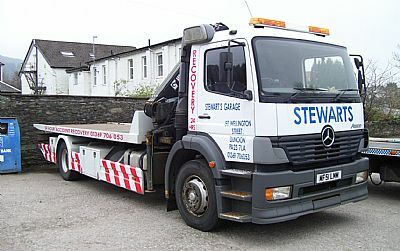 For the AA, RAC, Britannia and others, Stewarts garage was the obvious choice to serve the Cowal peninsular and beyond. 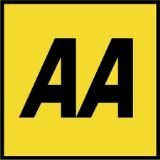 With a watertight reputation and a dedication to service that often goes far beyond customers expectations, in 2003 Stewarts garage became agents for the AA, RAC, Britannia, serving the whole Cowal peninsular. We are also agents for Green Flag, Equity Red Star, FMG Support, Europe Assistance, Call Assist and Mondial. Plus we operate for many insurance companies. The garage is more than equipped for every eventuality. Investing in the latest recovery equipment, the two 4WD Toyota Hilux trucks speed their way to the most rural breakdown site whilst the garage has also increased its capacity for long range relay with a transporter truck that can take 6 passengers. 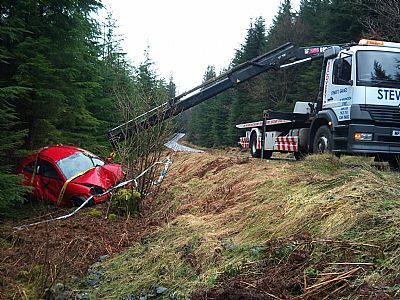 We have also invested in a major accident recovery unit with lifting capabilities, this ensures that we can cope with even the most major incident. 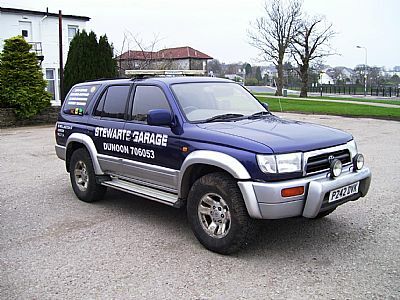 Stewarts garage is proud to be the help at hand when drivers become stranded, and that the name of the garage is synonymous with the speed and reliability of the motoring organisations the garage represents. It is no wonder that the garage was awarded a police recovery contract in 2000.
insurance, we will recover any costs from them.